People control their own consumer journeys. Consumers expect a borderless world in which they roam freely between a brand’s social media channels, email campaigns, blogs and e-commerce site, effortlessly buying things that catch their eye. It’s led to a sporadic, personalized shopping journey that frequently begins on digital touchpoints that weren’t built for commerce. That’s made it increasingly complex for brands hoping to meet customers’ needs and measure the results of their marketing strategies. At the center of this new customer-driven revolution is visual content. Images and videos play starring roles in the decisionmaking process, and provide consumers with a whole new level of inspiration and knowledge. 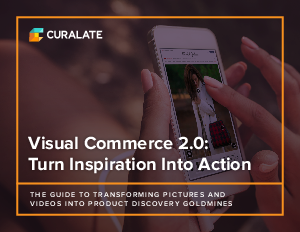 Every picture and video clip is now the entrance to a digital storefront, meaning brands can use them to drive not only engagement but revenue.